The Torah specifies two obligations concerning Shabbat – we are commanded to “keep it” and to “remember it” (shamor and zakhor). Therefore, it is customary to light two candles on Friday night. 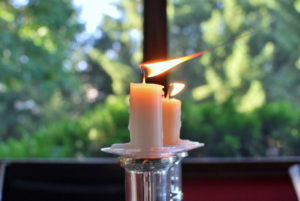 The first candle is to demonstrate that we remember the Shabbat, the other candle is for the action of “keeping” Shabbat. 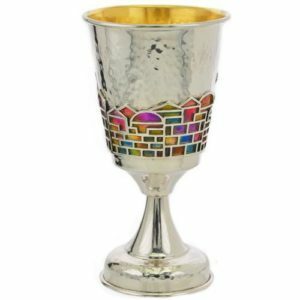 To honor the mitzvah of reciting Kiddush, a silver goblet is often used. Although any cup can suffice, the cup should hold a revi’it (3.07-5.46 fl oz.) of wine or juice. 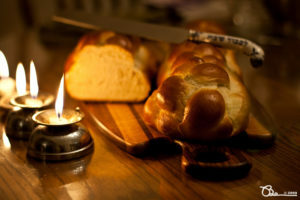 We place emphasis on the blessing over the wine or juice, by covering the challah before reciting the kiddush, Some interpret this allegorically, saying that if we go out of our way to protect even an inanimate object (the bread) from being “insulted” (by the blessing over wine taking precedence), then certainly we must go out of our way to display sensitivity toward the feelings of other people. The challah is a symbol of the Manna that God made fall from the heavens to feed the Israelites when they were in the desert for 40 years after their Exodus from Egypt. Traditionally, there are two loaves of challah, alluding to the fact that God gave a double portion of Manna so that the Israelites could rest from gathering food on the Sabbath. Challah, sweeter and richer than regular bread, symbolizes the sweetness of Shabbat. The custom of blessing our children on Friday evening is a beautiful way of bringing gratitude and spirituality into our family. The words, taken from the priestly blessing in Parashat Naso (Numbers 6:24-26) are also recited by parents at our Shabbat-in-the-Woods family service and the congregation at Kabbalat Shabbat services on Friday evenings. The Kaddish, written in Aramaic, is recited slightly differently (including the Reader’s Kaddish and the Mourner’s Kaddish) in every prayer service. Saying nothing about death, its theme is the greatness of God, which is reflected in its opening words: “Yitgadal ve-yitkadash, Shmei rabbah–May God’s name be magnified and made holy…. 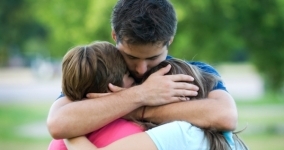 ” The prayer’s conclusion speaks of a future age in which God will redeem the world. 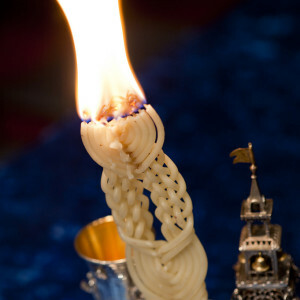 Havdalah, ushers in the new week, marking the end of Shabbat and Jewish holidays, and is generally performed at home. It involves lighting a special Havdalah candle with multiple wicks, reciting blessings over wine, sweet spices (besamim), and the light of the Havdalah candle. It ends with the singing of “Eliyahu Hanavi” (Elijah the Prophet), and blessing each other with Shavua Tov (have a good week). Havdalah is intended to require a person to use all five senses—tasting the wine, smelling the spices, seeing the flame of the candle and feeling its heat, and hearing the blessings. Learn more about the Havdalah service and prayers.